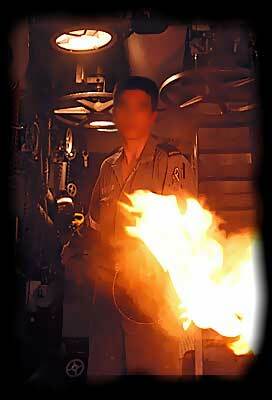 "Too many officers in the navy thought the new steam engines were a menace. The pride of the British Navy was the sparkling appearance of its warships, which were cleaned and scrubbed from morning till night. Showers of sparks and black soot blew out of the funnels and settled everywhere, thus entailing much extra scrubbing to make the vessels clean." 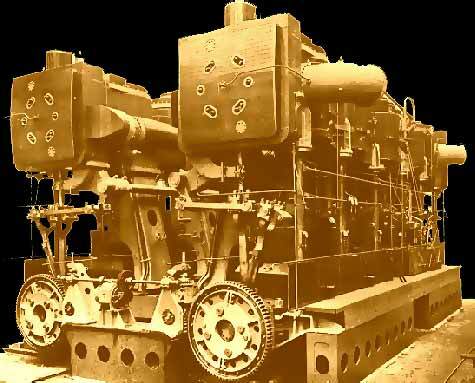 Whilst this was the general opinion held by naval officers regarding the early marine steam engines, their opinion of the men who tended them was much less complementary. 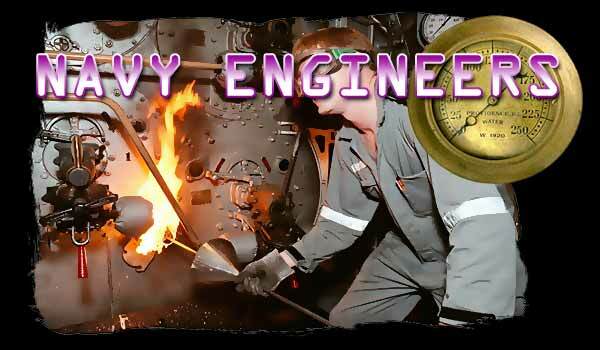 Prior to the formation of the Engineering Branch Afloat in 1837, ships engineers, or more correctly enginemen, were an anomaly, belonging to neither the military or civil branches of the service. They were directly recruited from engine works and forges and constituted a law unto themselves in matter of discipline. They came with the engine, but often left as they pleased. It was unkindly said of engineers that when recruited they had been found hanging around under a street lamp. The impact of engineers on the Royal Navy was profound. After generations of harsh discipline and unbending tradition, the navy was suddenly confronted with a breed of men totally lacking both. The navy was not too sure of how to deal with them, nor was it in a position to effectively apply any of the usual "remedies", after all, who else could handle the engines?. It was a state of affairs which could not be allowed to continue if the 'steam navy" was to expand. The earliest form of discipline acquired by the engineers was undoubtably professional pride. It rnanifested itself early, as evidenced by their performance in HMS MEDEA during her first commission, and laid the foundation for their own traditions. Conditions for engineers in the navy were undoubtably poor, and in a bid to improve the situation, the Admiralty, by Order in Council dated l0th July 1837, granted engineers Warrant rank, thereby elevating their status to that of the Civil Officers of the period, such as Masters, Pursers, Surgeons, and Chaplains. A further ten years elapsed before the more senior engineers achieved commissioned rank. Sailing Masters were themselves having an identity problem, and their promotional range was later extended before they were absorbed into the military, or executive branch, in 1867. Officers of the military branch studying at the Royal Naval College, Portsmouth, and later Woolwich, were required to undergo an examination on subjects connected with the steam engine, in accordance with Admiralty Order No 57, dated 8th December 1849 . Details of engineering subjects in which Officers were required to demonstrate competency by examination, were detailed in the annex to an Admiralty Circular dated March 16th 1853. Certificates of 1st, 2nd or 3rd class order were issued to successful candidates in the following form. 2nd Construction and Principle of the Engine, Boilers, &c.
3rd Practical working of the Engine and Boilers. 4th Expansion of Steam, and Economy of Fuel. 6th The Elements of Mechanics and Hydrostatics. 8th The application of these Branches of Science to the Steam Engine. The Captain is considered entitled to a Certificate (1st, 2nd, or 3rd ), for practical knowledge in the working of the Steam Engine. The pair of four cylinder triple expansion engines built by Scotts of Greenock for the British cruiser HMS Defence (1908); 40in + 65.5in + 75in(two) by 48in stroke, 13,500 ihp. The expansion linkage and eccentrics can be seen in this view of the after end of the engines; the toothed flywheels connect with the turning gear for turning the engines when making adjustments or repairs. A small change made to the uniforms of the Military Officers in 1860, to further distinguish them from Civil Officers, became rather symbolic. It consisted of the addition of a curl to the upper ring of gold lace denoting rank, and became known as the "executive curl". Changes to the Assistant Engineer grades occurred in 1861, caused by the creation of the new rank of "Engineer". "Engineer" became the new title of the serving Assistant Engineer Class 1, whilst serving Assistant Engineers Class 11 became Assistant Engineers Class 1, and Assistant Engineers Class III became assistant Engineers Class 11. The grade of Assistant Engineer Ill was abolished. It was an "lrishman's" promotion, but rectified an odd omission in rank progression inherent in the 1837 Engineering Branch structure, and provided a boost to the status of engineers. An odd feature concerning the status of "Engineer", and "Assistant Engineer" of the period was that after being examined for promotion, confirmation in the higher class was in the form of a Commission, not a Warrant. Apparently all Engineers were Commissioned Officers by 1862. 1863 was the occasion for further small changes to uniforms. This time it was the Civil Officers turn, with the introduction of distinctive branch colour bands between the rings of gold lace signifying rank. The original branch colours were blue for navigating officers (Masters, until 1867), white for Paymasters, red for Surgeons, and for Engineers, purple, which originally really was purple, similar to that later adopted by the engineers of the Mercantile Marine. "At that time Naval Engineers were simply workmen in uniform, necessary evils and treated as such". The growing importance of their profession made changes to the status of engineers inevitable. The first and possibly the most significant of these changes occurred in 1868,with the introduction of the Engine Room Artificer (ERA) rate. The ERA originally rated as a Petty Officer, and as the title implies, was a skilled tradesman. The new "rate" was an instant success and served the navy well. ERA's quickly established themselves and soon became a service institution. 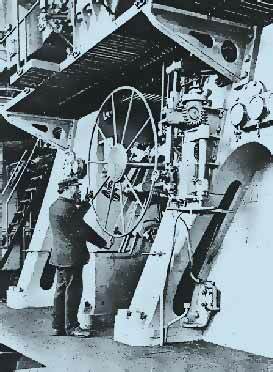 The advent of coastal defence breastwork monitors without rigged masts in 1870, and more importantly the entry into service in 1873 of HMS DEVASTATION, the first "mastless" seagoing battleship, meant that ships were gradually becoming totally dependent upon steam engines, and the Engineering Branch. By an order dated 30th April 1877, to take effect from the 1st April 1877, the new rating of Chief Engine Room Artificer (CERA) was created, to rank as Chief Petty Officer. The rate of pay was to be six shillings and nine pence per day, rising to seven shillings per day after three years service in the rate. The effective date may have been significant, for one of the qualifications for promotion to the new rate was to have served ten years as an ERA. As the ERA rate had been introduced only nine years previously, no one was qualified for promotion immediately. No doubt the original intake of ERA's were on their best behaviour in anticipation. The desire of the Admiralty for officers of the Military Branch to have a working knowledge of steam engines was an ongoing theme, reaffirmed by the following article in the 1888 issue of the Steam Manual. "One of the Engineer Officers, as the Captain may direct, will devote one or two hours in the course of each week to the instruction of all the subordinate officers of the Military Branch, and of such of the Commissioned Officers of the same Branch as may desire to avail themselves thereof, in the different parts of the Engines and Boilers, and in the practical working of the Machinery, and he will from time to time report the progress made by these officers in this important branch of knowledge to the Captain, keeping a progress book for the purpose as required by the Admiralty Instructions". The series of changes in status and rank structure which occurred from 1897 onwards were intended to eliminate some of the anomalies which existed in conditions of service between the Military and Engineering Branches, and which were the cause of much discontent. To appreciate the need for these changes it is necessary to understand the enormous extent to which the Engineering Branch had grown, and the responsibility placed upon it. 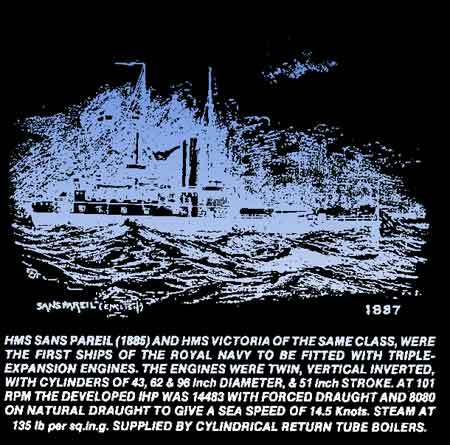 The triple expansion engines fitted in HM SHIPS SANS PAREIL and VICTORIA in 1887 marked the beginning of a dramatic increase in the power of major warships, and consequently to a greater demand for steam. The first successful water tube boilers made their appearance in the navy in a modest way in the same year, but the main generator of steam at this period was the cylindrical, return tube type (Scotch), some of which were double ended, (from 1874) and all were manually coal fired. By Order in Council dated 18th May 1897, the Warrant rank of "Artificer Engineer" was introduced exactly sixty years after the original style engineers were granted Warrant Officer status. Ironically this second period of Warrant rank in the Engineering Branch was to last just marginally less than sixty years. The engineers' rank structure was then Engineer in Chief - Chief Inspector of Machinery Chief Inspector of Machinery Inspector of Machinery afloat Fleet Engineer Staff Engineer Chief Engineer Engineer (1861) Assistant Engineer Artificer Engineer (1897) The Engineer in Chief held the rank of Chief Inspector of Machinery, as did a number of other engineers who were subordinate to him, but equal in rank. In 1900 this anomaly was rectified, and a few, but not all, equivalent ranks established by an Order in Council, which stated that, "The Engineer in Chief was to enjoy rank as Engineer in Chief, and would no longer rank as a Chief Inspector of Machinery". His equivalent rank was to be that of a Rear Admiral. The rank of Staff Engineer was abolished, and promotion to the rank of Fleet Engineer was to take place on attaining eight years seniority as Chief Engineer. The established equivalent ranks were then.. It should be noted that seniority operated within the Lieutenant rank, Senior Lieutenants of eight or more years seniority, and Lieutenants of less than eight years seniority. There was no Lieutenant Commander rank as such until 1912 although Senior Lieutenants wore two and a half rings of gold lace on their uniforms. In 1904 the oddest peace time Order in Council ever issued relating to the Engineering Branch, stated that Chief Artificer Engineers and Artificer Engineers, were to be eligible for promotion to the rank of Engineer Lieutenant, "as a recognition for acts of gallantry". The sense of the order has been lost with time, certainly the only hostilities involving engineers in 1904 was the Battle of the Boilers. The last of the old style entry engineers passed out from Keyham in 1910, an event almost coinciding with the first of the (E) officers commencing their specialization training. A timely incentive was given by an Order in Council dated 8th August 1911, which introduced specialist pay for officers qualifying in engineering. Another innovation in 1910 was the introduction of the Commissioned Mechanician, and Warrant Mechanician ranks, thereby providing an avenue of promotion for mechanicians similar to that for ERA'S. The mechanician rate comprised especially selected men from the stoker rates who were given intensive engineering training. Many fine men emerged from this rate. An old established naval rank was put to new use in 1914, with the introduction of the rank of Mate (E), the object was to provide Artificers with direct access to commissioned rank. A surprising aspect of this scheme was that on completion of training, Mate (E)'s were promoted to the rank of Engineer Lieutenant, instead of Lieutenant (E), inadvertently prolonging the old style engineer title. The most important change of all affecting the old style entry engineers, occurred on the lst January 1915 when they were absorbed into the Military Branch. Existing titles were retained, but Military Branch uniform was adopted, including the wearing of the executive curl on the upper gold lace ring denoting rank, and Engineer Commanders and above wore the the appropriate oak leaves on their caps. This ended a situation which existed for a while whereby recently qualified junior (E) officers were in the Military Branch whilst the majority of Engineer Officers, including all the seniors were Civil Branch Officers. The last differentiation between engineers formerly of the Civil Branch, and other officers of the Military Branch, involved seniority in the rank of Captain. Engineer Captains of eight years seniority ranked only with Captains of three years seniority, whilst those of less than eight years seniority ranked only with Captains of less than three years seniority. Unfair though this situation may appear, it would become ludicrous when the first of the (E) officers reached the rank of Captain. Before this happened however, in 1918 Engineer Captains were granted equal seniority with their executive counterparts. The immediate post World War One period produced a number of changes in rank titles and uniform details. Changes relevant to the Engineering Branch were in the Warrant ranks. In January 1919, Chief Artificer Engineers, and Artificer Engineers of both over and under l0 years seniority, in common with all other officers of equivalent rank, dispensed with wearing three brass buttons and associated elongated vertical button holes on the cuffs of uniform sleeves and adopted the title of Commissioned Warrant Engineer (a contradiction of terms) and Warrant Engineer respectively. This latter title had existed in the Royal Naval Reserve since 1903. Both ranks continued to wear the purple cloth of the branch below the gold lace ring, and the differentiation in seniority of former Artificer Engineers was discontinued, and all officers of this rank wore the quarter inch wide gold lace of Warrant Officer. By Order in Council dated November 1925, the concept of "branches" within the service was discontinued and twelve categories substituted in lieu. One effect of this order was to extend the wearing of the purple cloth between the rings of gold lace denoting rank, to (E) officers who previously had been indistinguishable from Executive Officers. As if to mark the beginning of a new era, the order stated that a more distinctive shade of purple was to be used. The new shade adopted could more accurately be described as maroon than purple. At this time the Admiralty gave (E) officers the opportunity of reverting to the executive category, or to continue their engineering career. Thereafter officers were entitled to use the suffix (E) from the time of electing to specialise in engineering instead of after qualifying as previously. Hence the appearance of the designations Midshipman (E) and Sub Lieutenant (E). The few minor anomalies remaining in the rank structure were gradually eliminated, in February 1926 for instance, it was decreed that when Warrant Engineers, Warrant Mechnicians, and Mates (E) were commissioned, their promotion would be to the rank of Lieutenant (E) instead of Engineer Lieutenant as formerly. The old rank of Mate, and its engineering equivalent Mate (E), were abolished in August 1931, and these officers became known as Sub Lieutenants, in the same manner as officers promoted from Midshipmen. New regulations which came into force in January 1956, virtually reverted to the common entry system of 1902 for the training of the future officers, although the entry age was higher. Specialization was to begin after completion of a general training course, and the wearing of distinctive colour denoting specialization was discontinued for all officers except surgeons. Warrant rank officers became known as Special Duty Officers, with improved promotional prospects. Commissioned Warrant Officers, including Commissioned Engineers, became Lieutenants (SD), whilst Warrant Officers, including Warrant Engineers, became Sub Lieutenants (SD). One of the changes which occurred in the Royal Australian Navy as a result of the three services being placed under the Department of Defence, was the reintroduction in January 1972, of the rank of Warrant Officer in non commissioned form. Thus, by an historical coincidence, HMAS KIMBLA'S Engineer Officer during her final passage on the morning of 20th December 1984, was a Warrant Officer. Early Steam engines were often employed on various haulage tasks previously performed by horses. It was therefore natural that comparison should be made between their relative power, and to express the power of a steam engine in terms of equivalent horses. The unit of work had long been the foot-pound, that is, a force of one pound moved through a distance of one foot. A very small unit for practical purposes. As power is the "rate" of performing work, the power of a steam engine, like that of a horse could be measured in foot pounds of work performed in one minute. Although this was the scientific way to describe the power of an engine, the resulting value was usually a large meaningless figure. More importantly the power of an engine expressed in foot pounds per minute failed to provide a means of comparison with the power of a horse, which was an unknown quantity. Watt established the unit of horse-power by a series of experiments conducted at the London brewery of Barclay and Perkins. A heavy dray horse pulling on a rope passed over a pulley suspended above a deep well, was found to be capable of lifting a load of 100 lbs at a rate of 2.5 miles per hour. This is the equivalent of 22000 foot pounds per minute. As horses vary considerably in strength, Watt added 50 per cent to the determined value in order to give his customers good measure, and as a concession to sceptics. Thereafter he rated his engines on the basis of a HORSE-POWER (HP) of 33000 foot pounds per minute. HP remained the legal Imperial unit of mechanical power until the introduction of the "SYSTEME INTERNATIONAL" (SI) metric units. Appropriately the universal unit of power then adopted was the"watt" (W) - NOMINAL HORSE-POWER Watt found that the mean effective pressure usually obtained in the cylinders of his atmospheric engines throughout the working stroke, was 71bs per square inch absolute. He also held firm opinions regarding the optimum piston speed for his steam engines, and set the value at 128 x Y stroke feet per minute.